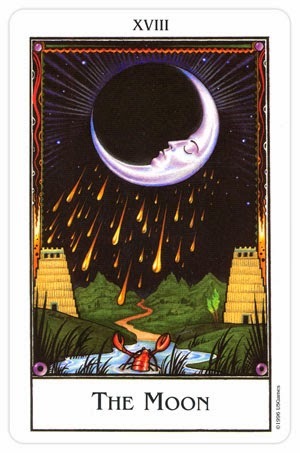 The Moon card suggests that my alter ego is the Magnetic One, whose superpower lies in my innate ability for reflection, and that of turning the tide. Today I feel like a natural woman. I am a goddess that reflects the mystique and magnetism of women, rising above all boundaries. 'This too shall pass.' Shining brightly, I will overcome empty promises in the dark and dangerous liaisons. Enjoy the thrill of the hunt and the drama when your forces of attraction are at their strongest. Generosity, contentment, security, feasting, harmony, happiness, balance, concord, victory, success, personal satisfaction, advantage, positive energies, material gains. 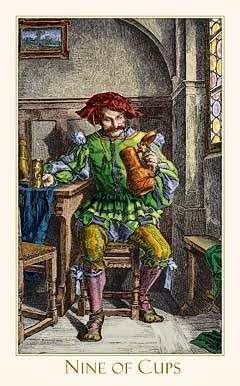 The Nine of Chalices card suggests that my power today lies in satisfaction. I have the self-respect, space or esteem that I need to "bartend" my resources or to live large emotionally. I am confident in and gratified by expressing what is close to my heart or in sharing my happiness like a buffet of joy. I take pleasure and pride in the new order I have created by clean sweeping emotional clutter or in honoring what has meaning. I am empowered by recognition and my gift is contentment.